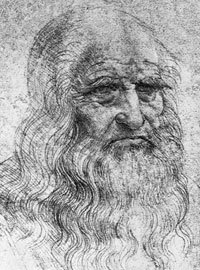 It is out of the question, that one of the greatest geniuses of the mankind Leonardo da Vinci, mentioned in several other pages of this site, designed automatic machines. Although it is clear that he invented such devices, the materials that survived until this day doesn't give a clear account on the way they operated. Recently numerous attempts to recreate Leonardo's automata have been made by various scientists, groups and museums. These reconstructions do differ in those nuances that are not fully defined in Leonardo's manuscripts. There are stories, telling that Leonardo made a mechanical lion, made with a wonderful artifice and able to walk forward and present flowers at the end of its performance, opening its chest to reveal a cluster of lilies. It is said that this machine was presented to the King of France Francis I as an amusement or as a diplomatic gesture during a banquet hosted by Florentine merchants and Giuliano de' Medici in Lyon in honor of Francis I on 12 July, 1515 (the Lion is the symbol of Florence, and lilies are the fleurs-de-lis of France. The bond between the two was also linked through marriage as Giuliano's wife, Philiberte of Savoy, was an aunt to the new King.) The mechanical lion perhaps was presented also during the peace talks between the French king and Pope Leo X in Bologna on December 19, 1515, where Leonardo was invited: "wherefore Leonardo being asked to devise some bizarre thing, made a lion which walked several steps and then opened its breast, showing it full of lilies". Later Leonardo took the lion when he moved to Château du Clos Lucé in France and the device was demonstrated and caused a great stir at the festival organized at Argentan in 1517. As with many other Leonardo's inventions however, neither the way this automatic machine worked is not completely clear, nor any drawings (if any exist) are still discovered in the Codices. The way it should work is not fully clear either. 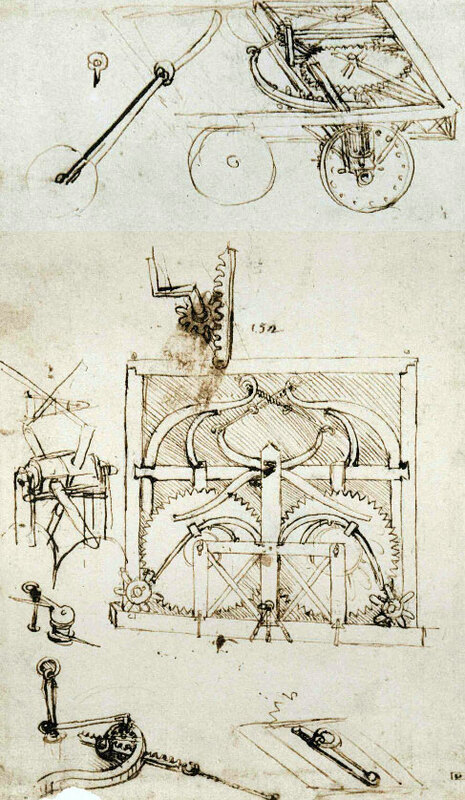 On the page 812 (right) (see the figure below) of the biggest collection of Leonardo's manuscripts, the famous Codex Atlanticus, is described a mechanism, often called self-propelled cart of Leonardo. These pages of the Codex Atlanticus are probably created in 1478-80, when the young Leonardo was still in Florence. 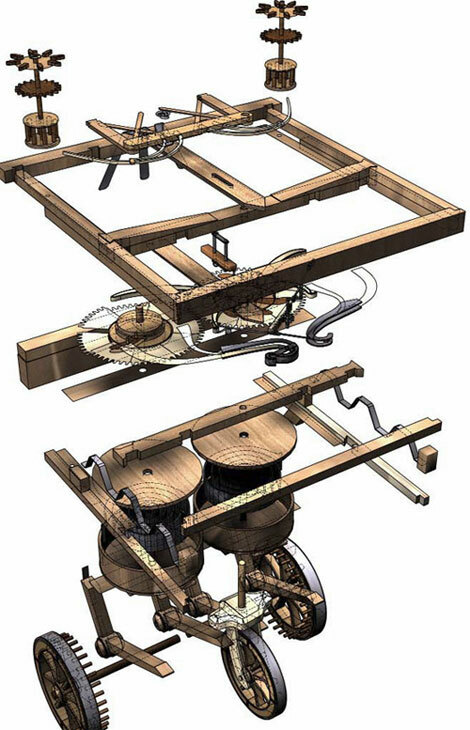 This famous drawing of Leonardo is, in fact, a complex model for an automaton, and it seems that the cart was devised for use in theatrical settings, an area of particular interest of Leonardo. The drawing at the top is most probably an unfinished first draft. In the center is the view from above. Obviously the vehicle can be programmed and is wound up by the mainsprings (the large spiral springs underneath the horizontal cogwheels), which also to act as a lever system for theatre puppets. 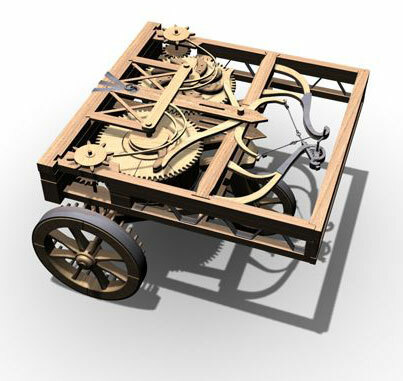 The "crossbows" are auxiliary systems, while the small lower wheels represent the escapement mechanism. The details surrounding the central drawing are studies of braking systems and fixtures for the auxiliary systems. An additional ingenious device serves as a remote control handbrake. There have been many inaccurate reconstructions of this machine which served to do little more than raise doubts as to the real functioning of the cart. In 2004 a functioning model was built by the Istituto di Storia della Scienza, Florence (see the image bellow), and Leonardo3 research group in Milan (see the upper image), though inevitably there are aspects of the design that remain speculative. 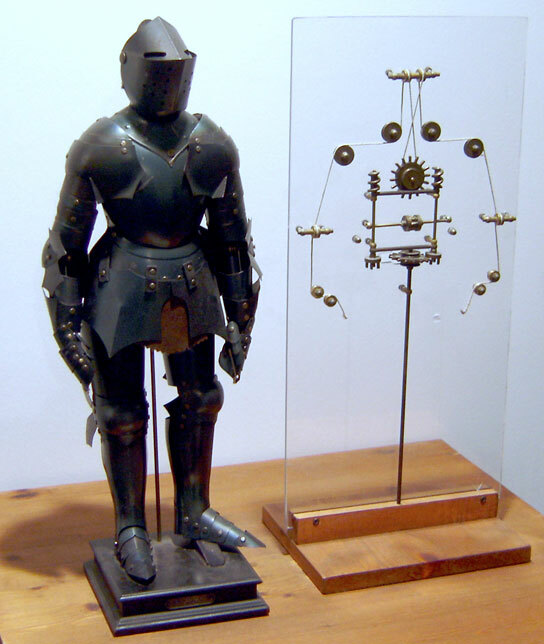 Among the vast number of projects of Leonardo, there is also the so-called "mechanical knight". Some historians, studying the Codex Atlanticus and Codex Madrid mentioned this project. A attempt to reconstruct it was made in 1996, when Mark Rosheim published an independent study of the robot, followed by a joint enterprise with the Florence Institute and Museum of the History of Science which mounted an exhibition with an entire section dedicated to Rosheim's research on the subject. In 2002 Rosheim built a complete physical model for a BBC documentary. Since then, many exhibitions and museums of da Vinci's models have included a soldier on wheels labeled, "Leonardo's robot" (see the lower picture). Studies on the subject mention that manuscripts relating to Leonardo's idea for the robot are in the Codex Atlanticus, specifically pages 579r, 1077r, 1021r and 1021v as possible sources for the mechanisms of this mysterious humanoid robot. Basically, it is a knight, clad in typical German-Italian suit of armor of the late fifteenth century, that is capable of some human-like movements. It can sit up, wave its arms, and move its head via a flexible neck, while opening and closing its anatomically correct jaw. It may have even made sounds to the accompaniment of automated drums (an automatic drum-roll within its mechanism). 2. Four-degree-of-freedom arms with articulated shoulders, elbows, wrists, and hands. The orientation of the arms indicates it was designed for whole-arm grasping, which means that all the joints moved in unison. A mechanical, analog-programmable controller within the chest provided power and control for the arms. The legs were powered by an external crank arrangement driving the cable, which was connected to key locations in the ankle, knee, and hip. It is believed, that Leonardo demonstrated his "mechanical knight" in 1495 in Milano.